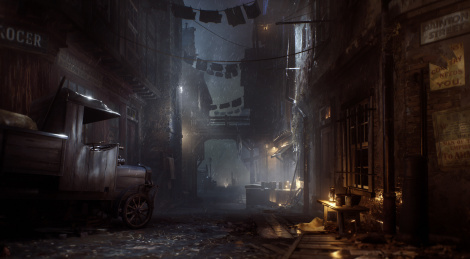 Vampyr took its time and after some mixed previews last February, it was probably the best thing to do to make sure some of the problems with the combat system wouldn't be there at launch. Although not everything is perfect in DONTNOD's take on the vampire myth, the game is quite captivating for many reasons, as you'll see in our verdict and +/- section. If everything goes according to plan, we should be live with composer Olivier Derivière on Thursday evening, so stay tuned. It takes a bit of time to fully dive into Vampyr, but it's a game that we have really enjoyed up until the end. We were a bit worried about the combat system but it works a lot more than we thought. It's just a bit of a shame that it does not offer as much challenge as you'd expect, even when not killing too many civilians to help you level up the main character. The presence of more than 60 unique NPCs with their own backstory makes the game quite unique as you can really decide of their fate, which has consequences on the game world and the story itself. Now you should be warned that Vampyr is an extremely chatty game, so you're going to spend a lot of time talking to people, getting to know them, which will make your decisions even more complicated. Though technically imperfect, with the AA traces you get to expect from such productions, we have found the reproduction of 1918 London to be particularly well done, with nice fog and lighting effects that help support the excellent art style. The sound design is also excellent, with great tracks composed by Olivier Derivière and good voice acting overall. 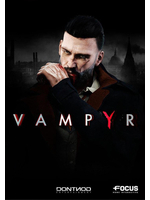 At the end of the day night, Vampyr is a game that is perfectly recommendable provided you can go past its few technical shortcomings. This is a shame because I remember people who played it at the preview event were saying it was very hard. Are the opening hours still hard or did they tone it down? another one bites the backlog list. It's a bit harder but overall they must have toned it down. Thanks for the review and videos! Just a question, have you tried not killing anyone? I'm asking because I'm wondering if it's possible to not kill anyone - outside of Main Story mandatory kills if they exist. Also, while I agree that a lack in difficulty is a bummer, they probably did it to make the game less hard for those who do not want to kill anyone. Though incidentally it also made the game easier for those who do kill. I'm sure there's a way to balance things out and do a sort of scaling system similar to what Dark Souls games do with New Game+ runs, by making the game harder for those who kill and not as hard for those who don't. But the more one kills, the more harder the game becomes. - Above 90% = Nightmare Difficulty. To further add to this, even if you only kill 5% (3-4 people), the game's difficulty progressions raise a little, like: enemies become more easily aware of you, get 5% more health, deal 5% more damage, are 5% faster, etc. You kill 10% (6-8 people), it raises to 10% and so on, but when you reach a "threshold" like 30% kills, you raise the difficulty to an entirely new level. When you pass a threshold, there are more enemies, they have better/different weapons and armor, certain player abilities deal less damage or have different effects because of better/different enemy gear, etc. I have just finished replaying Dark Souls and these things would help make not just Vampyr, but many more games have a much better difficulty that could be adjusted to most players' skill levels. I even remember some games adjusting the difficulty depending on how well you performed, so that's another alternative as well - if the player is finishing fights fast and without losing much Health, increase the difficulty by 10% and so on. I know these things may seem like a lot, but I thought of them almost immediately, which surprises me why the developers didn't, or did, but decided not to implement them. Perhaps it was too late in the development cycle. I hope you can at least share these ideas/concepts with Olivier Derivière, even though he's the composer, maybe he can pass it along to the developers. But if not, it's okay as well. I'm sure that they will eventually add difficulty levels in the weeks and months to come. they kinda screwed the pooch with this games systems by the sounds of all the reviews. i honestly kinda wish it was more traditional in the way it rewarded exp. and the moral dilemma of killing people or not simply gave you bonus exp or special abilities. maybe make it so healing people gave you human skills and feeding on them gave you more vampire abilities. kinda like how prey works with it's neuromods. it would tie everything together better and because you were gaining exp through combat, would make combat feel more vital. as it is it sounds like the whole "feed/don't feed" system is at odds with largely unnecessary combat, which sounds kinda crap. Not killing citizens makes the game harder but I've only killed 3 out of 60 something. The reason why it is harder is because killing them gives you more xp than when completing missions.